Refined & Premium Quality Business Cards guaranteed..!! Offering Visiting Cards Designs for Free. 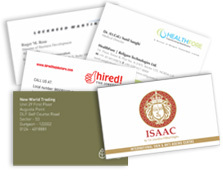 Business Cards are a reflection of your Corporate Identity and Persona. Get an efficient business card design created by us to add up to your professional endeavors. We offer readymade business card templates available on our website which can be easily personalized by the user. So go ahead, start ordering and let us give a very unique look to your business or visiting cards to enhance your professional competence. Trusted among masses for over 20 years in creating a lasting impression by delivering top quality documents at their doorstep. We have been printing approximately 30 lakh cards every year (2.5 lakh cards every year) thereby successfully printing over 2.5 crore visiting cards in the past 10 years. We are First in India to provide a 30-day return policy (conditions apply) with sincere commitment to quality. Our top management team carries a combined experience of over 100 years in top technology, services and printing organizations in India, promising nothing but the best value for your money. Our readymade templates save good amount of money, time and energy of your business. We offer 24x7 ordering service platform. We also provide free shipping within India. Efficient graphic designing of products. Efficient online designing tool and exceptional printing results. Copyright © 2011- 2019 Printland.